A key route linking London to East Anglia has been named as the worst road in Britain in a survey of 4,000 drivers by an insurance company. 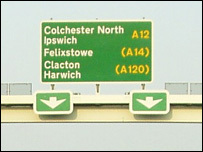 The A12 from London to Great Yarmouth, Norfolk, has a particularly bad stretch near to Colchester in Essex, the Cornhill Direct survey said. This stretch has potholes and regular closures due to roadworks. The next-worst road was the M8 between Glasgow and Edinburgh, followed by the A30 near Bodmin in Cornwall. The survey found that 85% of motorists questioned wanted the government to spend more money on the general upkeep of Britain's roads. As many as 25% said they knew of damaged roads that had not been repaired for five years or more and the same number said they would be prepared to pay more for their vehicle excise duty (road tax) to improve the condition of roads. Of those who responded, 14% claimed they had had an accident because they have swerved to avoid a pothole, and the same number said they had slipped on a bad road surface and crashed the car. A fifth of motorists have tried to take things into their own hands by reporting the poor condition of a road surface to their local authority. The next three worst roads in Britain were cited as the A361 near Glastonbury in Somerset; the M6 along the Birmingham stretch between junctions eight and five; and the M5 northbound between junctions 12 and 10 east of Gloucester. Also in the top 10 were the A338 between Great Shefford and junction 14 of the M4 in Berkshire; the M5 near Bristol; the A525 in the Wrexham area of north Wales and the M74 in the Lanarkshire area in Scotland.